Following on from the 2016 publication of volumes 1 and 2 of "Anthologie historique de la prose romanesque taïwanaise moderne (A Historical Anthology of Modern Taiwanese Romantic Prose)," editors Isabelle Rabut and Angel Pino, sinologists and recipients of the Taiwan-France Cultural Award, have returned with the third and fourth volumes in the collection. 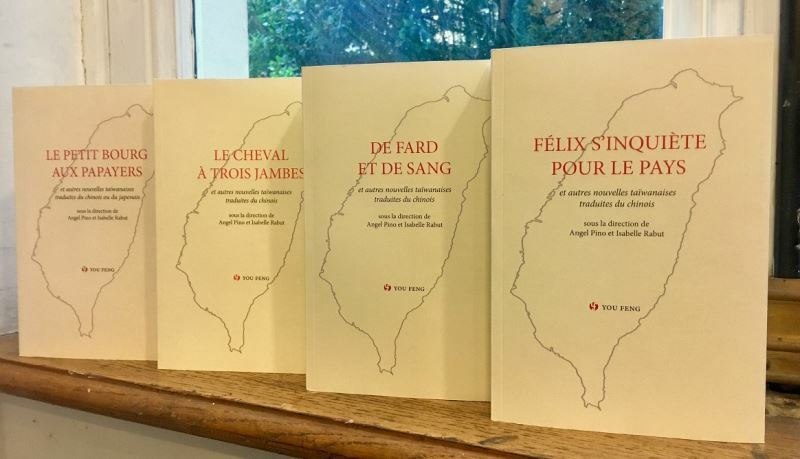 As part of the "Lettres taïwanaises" series, these latest volumes continue the work of presenting the diverse faces of 20th-century Taiwanese literature, this time through works including French translations of Li Ang's "Blush and Blood" (in French, "De Fard et de Sang") and Chang Ta-chuen's "Felix Worries for the Country" ("Félix s'inquiète pour le pays"). The collection pays special attention to the historical context of each piece, striving to present the common experiences of the Taiwanese people through these literary creations. Li's "De Fard et de Sang" and Chang's "Félix s'inquiète pour le pays" are particularly noteworthy entries. The former uses makeup as a metaphor for death and history repeating itself, taking a head-on look at great historical truths, indifference, and grief that cannot be made over; the latter, meanwhile, looks at push and pull between the comfortable lives of residents of military dependents' villages and the loss of political consciousness. The editors of the anthology chose these works for how they each represent the different orientations of their respective volumes — volume 3 revolves around the works of native Taiwanese writers during the 1940s and 1950s, while volume 4 collects some of the most iconic pieces of the last two decades of the 20th century, focusing on the works of indigenous writers and writers from immigrant Chinese families. Rabut, a professor at Institut national des langues et civilisations orientales (The National Institute for Oriental Languages and Civilizations), and Pino, a professor at Bordeaux Montaigne University, were both awarded the Taiwan-France Cultural Award in 2012. They were chosen for their many years of work teaching Sinology at French universities, including many courses in Taiwan Studies, as well as their efforts to translate Taiwanese literature into French and raise awareness of it among French readers. 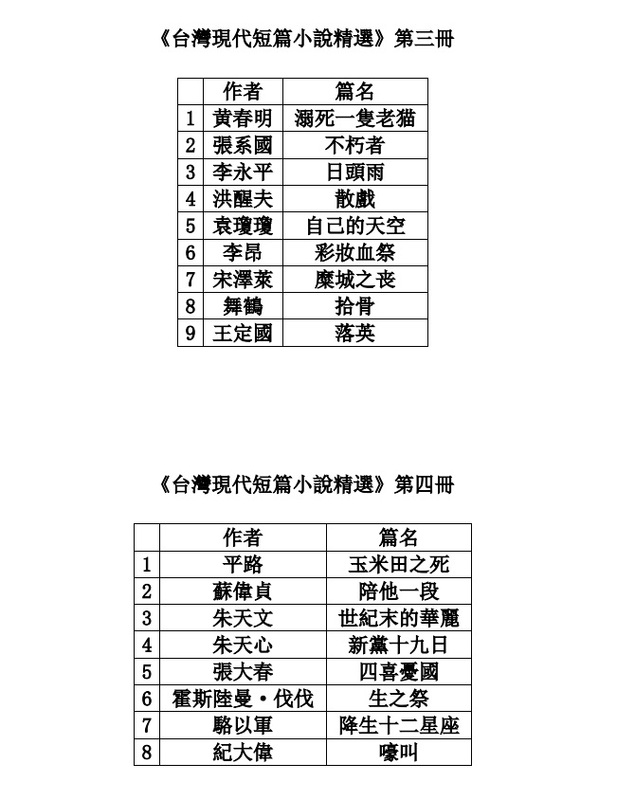 The two consider the originality and excellence of Taiwanese literature to be deserving of just as much recognition in France as Taiwanese cinema. The "Anthologie historique de la prose romanesque taïwanaise moderne" project is being undertaken through with the support and sponsorship of the Ministry of Culture and Pegatron chairman T.H. Tung. It aims to showcase each stage of the development of Taiwanese literature in the 20th century and give Francophone readers a more in-depth understanding of Taiwan's complex history and diverse society through the chosen works. The latest volumes of "Anthologie historique de la prose romanesque taïwanaise moderne" will be launched at a Feb. 1 event at 6pm at Librairie Le Phénix in Paris. The Taiwan Cultural Center in Paris will also be holding an introductory event for the books on Feb. 10 at 2:30pm, with Pino and Rabut present and featuring screenings of adaptations of the works collected in the new anthology. Visitors Today:85. All Time Visitors:1,229,892.